On December 16-17, 2014, the Ajinomoto Foundation led by Mr. Suchart Naksawek, Director of foundation, and M.R. Hideki Shibahara, Corporate Coordinator from Ajinomoto Co., Ltd. together with Miss. 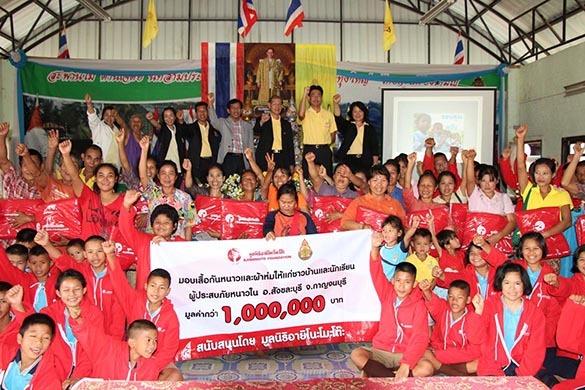 Sudjai Monrat, Director of Basic Education District Office, Kanchanaburi, District 3 donated 2,070 sweaters and 2,488 blankets worth more than 1,000,000 baht to students and villagers who suffered from cold weather in the area of Sun Kla District, Kanchanaburi.